Roses planted at the edge of each vineyard row at Chateau Gombaude-Guillot. 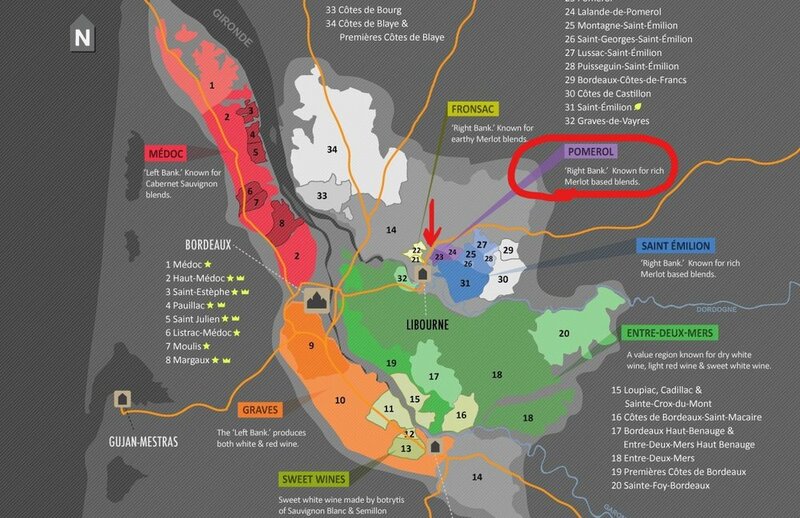 Pomerol is one of the smallest appellations within Bordeaux. 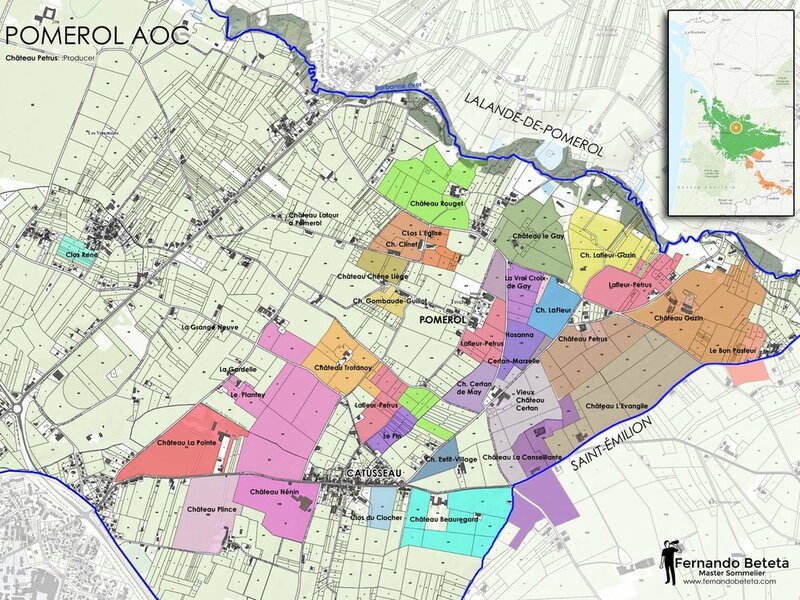 It accounts for only 800 hectares of the 120,000 planted to vine across the entire region. This pales in comparison to its neighbor, St.-Emilion which boasts 5,400 hectares (plus an additional 4,000 if you count the St.-Emilion “Satellites” AOPs). On top of that, to ensure ripeness and quality, vignerons in Pomerol are restricted on the yield they can produce from each hectare more-so than any other red AOP (49 hectoliters per hectare compared to the typical 57 hectoliters allowed in Left-Bank communes). Going one step further, the best of Pomerol wines come from the “Pomerol Plateau” in the northeast corner of the appellation. This plateau has a mixture of soil types, but the best mix is the world renowned Blue Clay with gravel and iron deposits. Petrus, the iconic producer from Pomerol, sits entirely upon the rare 40-million year-old clay. The surrounding estates still enjoy a mixture which brings great power to their wines. The wines of Pomerol are similar to the “Right-Bank” style as seen in St.-Emilion, Fronsac, and Cotes de Blaye; however, a larger emphasis is placed upon the use of Merlot. Local growers began to realize that Merlot was well suited to the clay and gravel mixture in Pomerol and replanted to majority of vineyards to it following the devastating frost of 1956 (sorry Dad, but that was a terrible vintage. Very few (if any) bottles were produced.). However, this disaster turned into a blessing. Once the vines planted at this time came into maturity, one of the best vintages for Bordeaux occurred in 1982. Combined with high reviews from critics at the time, the wines of Pomerol began to become increasingly desired and collected. View a close-up of the plateau estates at Master Sommelier Fernando Beteta’s website. Though the fame of Pomerol is somewhat recent, Chateau Gombaude-Guillot has a long history. The estate was first established in 1868. It was originally part of larger holdings in the Belevier family put was broken off and passed down to Maria Belevier as part of her wedding dowry. Maria’s great-grandaughter, Claire Laval, is the current manager of the estate, and under her care, Chateau Gombaude-Guillot has made a name for itself even amongst its more collectible neighbors. Under Claire’s direction, Gombaude-Guillot was the first Pomerol winery to convert to organic viticulture in the late 1990s. The 2000 vintage was the first Pomerol wine certified organic. Her interests as an agronomist lead to change in philosophy which the estate presents as their mission: “Pomerol, Terroir, Sustainability.” Claire now has the vineyards under application for biodynamic certification. The vineyards are a short drive from those of Petrus; however, the subsoil varies from the iconic estate. Whereas Petrus is atop a layer of blue clay, Gomaude-Guillot sits atop of large concentration of iron deposits which oxidize creating a layer of red-clay, quite typical of Pomerol. This lies underneath a layer of gravel and sand which allows for good drainage vine health. The vines at Gombaude-Guillot are an average of 40 years old, which is a mature range for Merlot. With only 7 hectares under vine, it is a rather small estate compared to its neighbors (Petrus boasts 11.5 and is considered mid-sized; however, Chateau Latour and Chateau Lafite Rothschild from Pauillac are planted to 90 and 112 hectares respectively). The grapes are all hand-harvested and produced in the typical style of Pomerol. The wine undergoes fermentation in temperature controlled concrete and stainless steel tanks followed by maturation for 12-14 months in a combination of new and used oak and concrete vats. For the 2011 vintage, 25% new Allier French Oak barrels were used with an additional 25% older barrels. The remaining 50% was aged in concrete. The wines of Chateau Gombaude-Guillot usually require at least 7 years before opening, so the 2011 is reaching its preferred drinking window. However, the wine can continue to develop in the bottle for many years to come. I recommend decanting the wine into a narrow decanter carefully to prevent the sediment from mixing back up into the wine, especially if you plan on cellaring the bottle. The wine can potentially age until 2026, but I would recommend drinking within the next three years, as the fruit may diminish too much for the balance of the wine. Claire Laval in the vineyards at Chateau Gombaude-Guillot.